Toys are physical items used in play by children. An estimated 2.6 billion toys, including electronic toys and video games , are sold in the United States each year, according to the Toy Industry Association, Inc. Toys can support cognitive growth, development of fine motor and gross motor skills , and improve problem solving and attention. Children may find extended periods of play with a toy, whether it was purchased in a store or found in the home (recycled plastic containers and empty spools of thread, for example). Most children will be happy to play with a few favorite toys—the size of the toy inventory is not critical to successful play. Parents and others who choose toys for children should take into account the following characteristics of the child for whom the toy is intended. These include the age and developmental stage, his or her interests, ease of use of the toy, the necessity for adult supervision, the presence of younger siblings for whom the toy could pose a hazard, and whether the toy is designed for independent play or group play. While computer and video game sales have more than tripled in the past decade, to nearly $240 million last year from $65 million in 1996, toys were expected to have their third straight year of slight decline in 2004. Children are still riding bikes, sipping from play tea sets, and enjoying some of the same toys their parents did, including building blocks, erector sets, and Lincoln Logs. But the pressures bearing down on traditional toys are many. Kids are growing up faster and putting down Barbie dolls and G.I. Joe action figures at an earlier age, increasingly smitten by the grownup images of young celebrities such as high-profile athletes, movie and television stars, and recording artists. The prime audience for toys has shrunk as the children of the immense baby boom generation have grown into teenagers and beyond. And as in other industries, giant retailers have taken sales from specialized toy chains and squeezed some of the incentive to devise the next great toy. Physical skills: Can the child manipulate and play with the features of the toy as it was designed? Understanding: Can the child understand how to use the toy? Interest: Is the toy of interest to a child of a particular age? Safety: Is the toy safe for a child at this particular stage? The Consumer Product Safety Commission (CPSC) has established a number of regulations related to toy safety. These are published by the American Society for Testing and Measurement (ASTM) under the safety standard known as ASTM F963. This standard is voluntary, but the majority of U.S. toy manufacturers comply with its guidelines. In fact, many incorporate a message about the toy's compliance with ASTM F963 on the toy packaging. Toy manufacturers consider the size of toy parts—which are likely to be put into the mouth by an older infant or toddler—in designing toys. Anyone purchasing a toy for the youngest children must take the choking hazard seriously and make appropriate selections. When a new toy is brought into the home or child-care setting, all wrapping material should be promptly discarded. Plastic wrapping in particular may pose a suffocation hazard to the youngest children. The U.S. government maintains statistics on toy-related injuries and deaths. Many accidents involving toys are not caused by the toy itself; for example, a child may trip over a toy that was not put away after play. When an unsafe toy reaches the marketplace, U.S. government inspectors may discover it and order its recall; additionally, vigilant parents and caregivers can observations about toy safety to the CPSC. Manufacturers routinely cooperate with the CPSC in recalling products that are deemed unsafe or dangerous. In 2002, the medical journal Clinical Reference Systems issued pediatric advisories on age-appropriate toys. Some of the recommendations follow. Suggested play things for infants include: interesting objects hung in view, such as brightly colored mobiles, crib decals, and colorful wall posters; sturdy rattles; large plastic rings; soft toys for throwing; colorful balls; light plastic blocks; cloth cubes; music boxes; teething toys; floating bath animals; washable squeak toys; nests of hollow blocks; and rough-smooth touching books; washable cloth picture books; and sturdy, colorful picture books. Suggested toys for toddlers include: pyramid rings; large nesting blocks; large and small colored building blocks; cuddly stuffed animals; large, soft balls; washable, unbreakable dolls; push-pull toys with rounded handles; simple musical instruments; sand box and sand toys; water toys; transportation toys (trucks, cars, trains, and airplanes); objects to imitate adults such as plastic garden tools, toy telephones, and toy dishes or pots; and sturdy, colorful picture books. U.S. law requires that toys and games for young children (ages three to six) carry a warning about choking hazards. If the toy or game includes small parts, marbles, or balloons, it must be marked that it is not appropriate for children under the age of three. Beyond toddlerhood, children begin to develop their own ideas about play activities and the toys that they want. They will be influenced by what they see advertised on television and by their peers. Toy fads and television show tieins can be powerfully persuasive to children. Parents may experience their first opportunities to teach about peer pressure and independent decision-making over toy requests. Toys should be selected to stimulate play and related cognitive and physical development; fad toys are less likely to sustain play activity and support development beyond the fad stage. Toys and play items appropriate for preschool-age children include: large and small transportation toys; cuddly toy animals; simple musical instruments; farm and zoo animal sets; miniature circus; hospital, police, and fire station sets; bean bags; large balls; art materials such as paints, modeling clay, paste, and colored paper; wagons; tricycles; crawl-through play equipment; simple construction sets; nursery rhyme books; humorous and playful books; activity books; and books about familiar people and places. 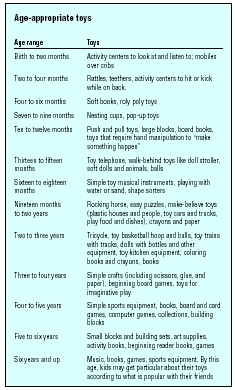 For early school-age children, six to nine years old, suggested toys include: construction sets; art materials such as crayons, chalk, paint, modeling clay, and simple weaving materials; chalk, Velcro, or flannel boards; small bicycles; wagons; jump ropes; simple board games; playhouses; puzzles; kites; globes or planetarium sets; aquariums; terrariums; and books about jokes, riddles, tongue twisters, animals, insects, birds, reptiles, and children from other lands and cultures. Appropriate toys for older school-age children, nine to 12 years, include: croquet, badminton, and shuffleboard sets; sports equipment (baseball, basketball, soccer, football, and tennis); skates and skateboards; aquariums and terrariums; craft sets; hobby sets; electric trains; radio-controlled vehicles; model kits; board games; microscopes; binoculars; compact disc players; camping and backpacking equipment; and books about adventure, science fiction, fantasy, science topics, simple biographies, and jokes, puzzles, riddles, and tongue twisters. In addition to product safety, one of the biggest concerns of parents is the growing trend towards toys and video games that promote violence, crime, and war. In 2002, a national department store chain published an advertisement on its web site for a toy called "Forward Command Post" that featured an American soldier standing in a bombed-out house. It's an example of the growing collaboration, in recent years, between the toy and entertainment industry and the U.S. military, according to the activist group Worldwatch Institute. Video games with themes of terrorism and war in Middle-Eastern settings are selling well. In video games, kids can experience virtual combat, are exposed to exploding virtual body parts, and practice committing murder and theft to win games. Traditionally, boys' and girls' toys have often been contrasted as being "rough-and-tumble" versus "nurturing." But that distinction may be disappearing, not only for healthy reasons of waning gender stereotyping, but for more questionable reasons such as the growing tolerance of—or obliviousness to—aggression and hostility in play by both sexes, according to an article in the May-June 2003 issue of World Watch , the institute's official publication. Many parents are concerned about the growing number and level of acceptance of toys and video games that promote violence and war. However, not everyone agrees on what constitutes a violent toy. Most parents agree guns are symbols of violence. But at what point is the line drawn between a child perceiving a play gun as a toy or a device of violence? Many might agree a BB gun is violent since it can kill and wound small animals and birds and injure humans. But what about a squirt gun that shots water or a Nerf gun that shoots foam balls? To help answer these questions, Daphne White, founder of the Lion & Lamb Project, published a list of guidelines in the November-December 2004 issue of Mothering magazine. Lion & Lamb is an organization founded in 1995 to stop the marketing of violent toys and entertainment to children. Two to four months Rattles, teethers, activity centers to hit or kick while on back. Ten to twelve months Push and pull toys, large blocks, board books, toys that require hand manipulation to "make something happen"
Promote violence and aggression as the best way to settle disputes. Depict violent actions as fun, harmless, and "cool." Encourage children to act out aggressive scenarios. Depend on "enemies" that must be "destroyed." An inability to play with or lack of interest in toys at an early age may indicate a developmental problem in such areas as gross and fine motor skills . If this is suspected, a pediatrician, psychologist, or other specialist should be consulted. Cognitive —The ability (or lack of) to think, learn, and memorize. Fine motor skill —The abilities required to control the smaller muscles of the body for writing, playing an instrument, artistic expression and craft work. The muscles required to perform fine motor skills are generally found in the hands, feet and head. Gross motor skills —The abilities required to control the large muscles of the body for walking, running, sitting, crawling, and other activities. The muscles required to perform gross motor skills are generally found in the arms, legs, back, abdomen and torso. See also Cognitive development ; Fine motor skills ; Gross motor skills . Neufeld, Les. Making Toys That Teach: With Step-by-Step Instructions and Plans. Newtown, CT: Taunton Press, 2003. Oppenheim, Joanne, et al. Oppenheim Toy Portfolio, 2005: The Best Toys, Books, Videos, Music, and Software for Kids. New York: Oppenheim Toy Portfolio (Publishers), 2004. Whittaker, Nicholas. Toys Were Us: A Twentieth-Century History of Toys and Toy-Making. Collingdale, PA: Diane Publishing Co., 2004. (No author). "Between the Lines." World Watch (May-June 2003): 28–29. Morantz, Carrie, and Brian Torrey. "Selecting Toys for Young Children." American Family Physician (Aug. 15, 2003): 763. Rubin, Judith L. "No More Junk Toys: Rethinking Children's Gifts." Mothering (November-December 2003): 46–53. Walker, Andrea K. "Joystick and Mouse Cut Regular Toy Sales." The Detroit News (Dec. 15, 2004): Business 1. White, Daphne. "From War Chests to Toy Chests: How to Change Your Child's Worldview for the Better, One Toy at a Time." Mothering (November-December 2004): 40–42. Toy Industry Association, Inc. 1115 Broadway, Suite 400, New York, NY 10010. (212) 675-1141. Web site: http://www.toytia.org. U.S. Consumer Product Safety Commission. Washington, DC 20207-0001. (800) 638-2772. Web site: http://www.cpsc.gov. U.S. Consumer Product Safety Commission. Toy Safety Publications. Dec. 13, 2004. Available online at: http://www.cpsc.gov/cpscpub/pubs/toy_sfy.html (accessed Jan. 2, 2005).